An award winning book has a captivating story and interesting characters. A memorable conversation involves an intriguing conversation partner who tells fascinating stories and asks questions. A unique and successful brand does all of the above because they have a well developed voice that draws the audience in and keeps their attention. It seems simple enough to be “captivating” or hold a conversation, however, finding a brand voice that stands out enough to resonate with an audience is challenging. Voice is often given a low priority within a marketing “to do” list, when it should be crucial. Sometimes social media and marketing content creation is passed to an intern or inexperienced marketing team member who does not fully grasp the intentions of the company. Establishing a defined voice humanizes the brand. A written representation of the brand is essential since that is how customers frequently communicate with companies - so the brand voice must be clear. The voice of the brand is the personality or adjectives that most describe the brand. The tone is the style in which the voice is conveyed. They both go hand in hand. The process to construct a brand voice may require trial and error. Some use formulas of stories, songs, or even comedians for inspiration. Awareness of the values and clear goals of the company keeps content and voice consistent and truthful. Everything written should tie back to the brand’s defined purpose and what they want to accomplish (whether to inform, humor, educate, uplift, etc). From these values, construct a large list of adjectives that are opposites of one another. The team can then select which adjective is more like the brand. Having trouble coming up with the word list? No problem! Utilize the resources that surround the brand - employees, upper management, and consumers. 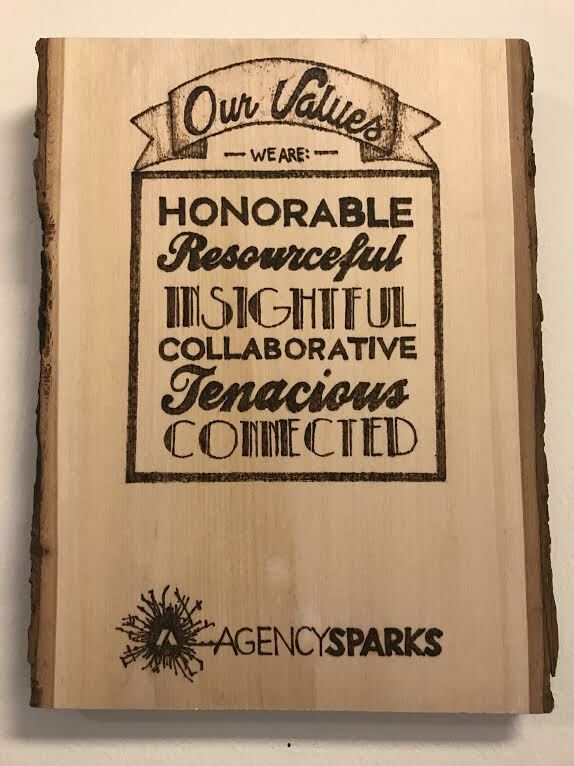 Ask them to describe the values and then the brand in it’s entirety in 5 words or less. An outsider's perspective and feedback uncovers new and helpful insights about the brand. A brand’s voice is meant to be unique, meaning, it will not likely please everyone. Cater to those who will care most - primarily customers. A way to further analyze the audience is to form persona descriptions and scenarios. Who and why are they reading the content? What are their needs and how is this content helping them achieve these needs? Not all content should solve the consumer’s issues. Content should vary depending on the audience and platform - this is where tone comes into play. For example, the AgencySparks blog has a professional vibe whereas the social media tone is more conversational. Both aim to inform and provide insights to marketers. A good analogy can be taken from music where different genres cater to different audiences. The same song can be sung with a drastically different tone despite consistent words. Consider remakes of classic hits and how they change audience and tone. As a marketer, assess what content the target market wants to see and provide them with just that. Written content frequently represents the brand in the consumer’s eyes. Keeping the content consistent and clear is of utmost importance. Assigning a small, efficient staff to produce content on a regular basis can ensure that the brand voice is unchanging. Over time, the consistency of voice will instill trust with followers and increase following. How unbearable is it when a different writer or director comes in and destroys the plot or character development in a movie series or show? When the new writer or director respects the style or universe, the change is less noticeable and more easily forgiven. If multiple people have their hands on content creation, keep a style guide to outline the dos and don’ts of the company. Vocabulary, jargon, and language should remain consistent across platforms. Proofreading is also crucial to ensure the voice and and tone remain true to the brand. Define the voice as if it were a person in a conversation. No one wants to talk to a robot. Some brands, like Wendy’s, succeed in humanizing their brand by being snarky, sarcastic, and clever. This type of person would not be the ideal best friend, but someone entertaining to listen to and watch. Take a second to think about the brand’s likes and dislikes if it were a person. How would it talk during a conversation? Read posts out loud. If they match the image of the brand and the values, then post. If not, rewrite. Sometimes rewriting a phrase three different ways helps find the perfect wording. The brand’s identity should be defined by the values but the voice is how the brand expresses those beliefs. Comedians take up to ten years to find their “comedic voice.” Through trial and error, they figure out what works for their audience and represents them as a comic. Most of the time, the joke itself is not as funny, but it is the way the comic says the joke - the tone makes it hilarious. For marketers, you should swear if the audience and values align with that approach. Be humorous if it will resonate with the crowd. Find humor in little things. Tell a story people want to listen to and share with their friends. Be bold and clever. Don’t copy other brands’ success - form a unique voice. Be conversational. Or be business-like and straightforward. Want to connect emotionally with the target audience? Be empathetic! Or be cold and sassy. No matter what, be human, always. A helpful article with examples, questions, and guides to form the perfect marketing brand voice by Kevan Lee sighted a brilliant quote by Jay Baer, "[d]on’t just give your customers something to talk about, give them somebody to talk about." Think the voice is already defined? Check by tracing through old blog content and media posts. If the company has changed over the past years and no longer upholds the same values, use the exercises in step one (ask consumers and employees to explain values to define characteristics/personality of the brand).